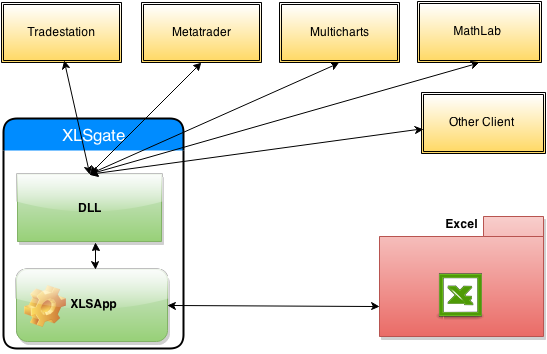 XLSgate is a middleware application to coordinate data input/output between clients (trading applications, other applications) and Microsoft Excel(TM). XLSgate makes it very easy to communicate with Excel. Without XLSgate you would need to understand complex programming practices with Microsoft COM Objects. Moreover many client applications such as Metatrader, Tradestation, Multicharts, MathLab, Ninjatrader etc are not able to work with COM Objects. You would need to solve bugs yourself and understand complex multithreading concepts. XLSgate is your mate to solve all these problems for few dollar. Our team will solve every bug and update to latest version as soon new versions come out. You access from any Client (for example Trading Software) through DLL to XLSApp. XLSApp is kind of multiplexer, it coordinates incoming requests and sends them to Excel. XLSApp displays several Debugging information, this way you can debug while you code yourself. XLSApp is designed to use very low resources. It needs to run in systray while you are using XLSApp. Make sure to start XLSApp before starting Client. XLSApp will manage rest for you.